You might think that a company called Isis Pharmaceuticals would be itching to change its name in order to avoid confusion with the terrorist organization Islamic State of Iraq and Syria (ISIS). Heck, the company's ticker symbol is even "ISIS." But Isis (ISIS), a biotech based in California, doesn't appear to be suffering due to its now unfortunate corporate moniker. In fact, shares rose more than 10% on Tuesday and are up more than 32% in the past month. What gives? Strangely enough, Isis may be benefiting from another hot trending topic on Twitter (TWTR), Instagram, YouTube and Facebook (FB): the ALS ice bucket challenge. Isis is developing many drugs aimed at treating a variety of neurological disorders, including ALS ... more commonly known as Lou Gehrig's disease after the Yankees great who was afflicted with and died from it. Even though Isis has a lot of drugs in its pipeline, including others for various forms of cancer and cardiovascular diseases, it looks like investors have been attracted to Isis lately because of all the focus on ALS. Many Facebook users' news feeds are now devoted to videos of their friends, family (and of course, celebrities) dumping buckets of ice on themselves and challenging others to donate to ALS charities and/or also douse themselves with frozen water. So it's no wonder investors are not that concerned by the fact that Isis shares its name with arguably the most hated organization in the world. 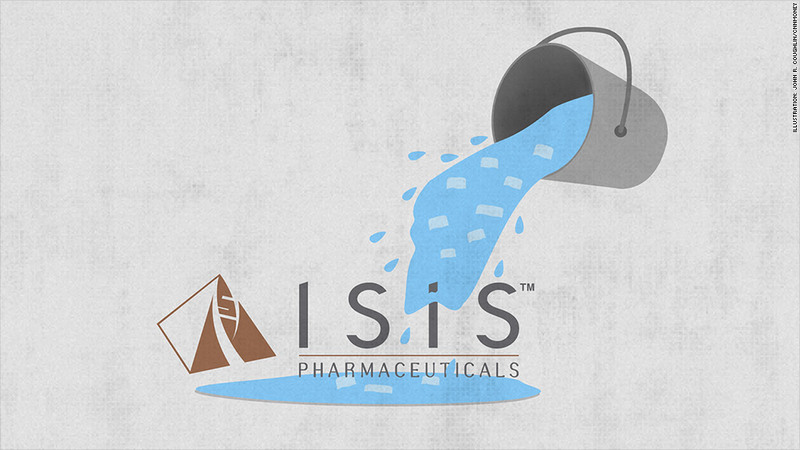 Drug company Isis shares its name with the terrorist group. But thanks to an ALS drug, it may benefit from the ice bucket challenge. Now about that name. Walke said that most calls about the name are coming from reporters, not investors. He added that because Isis is not a large drug company with many products already on the market, Isis feels there is no pressure to change its name or ticker symbol. And why should it? Even though some other businesses named Isis, such as the mobile wallet service developed by telecoms AT&T (T), Verizon (VZ) and T-Mobile (TMUS), are rebranding, I don't see why Isis, a company founded 25 years ago, should do the same. "Our investors know us well," Walke said. It is painstakingly clear that Isis Pharmaceuticals chose its name as an homage to the Egyptian goddess. The company's logo is a pyramid after all. And given how well the stock has done in the past month, a time when the Islamic State of Iraq and Syria has been dominating the headlines, it really doesn't seem as if Wall Street cares that the company's ticker is likely to show up on social media sites next to stories about horrendous acts of violence. So should you buy the stock? That's a different story. 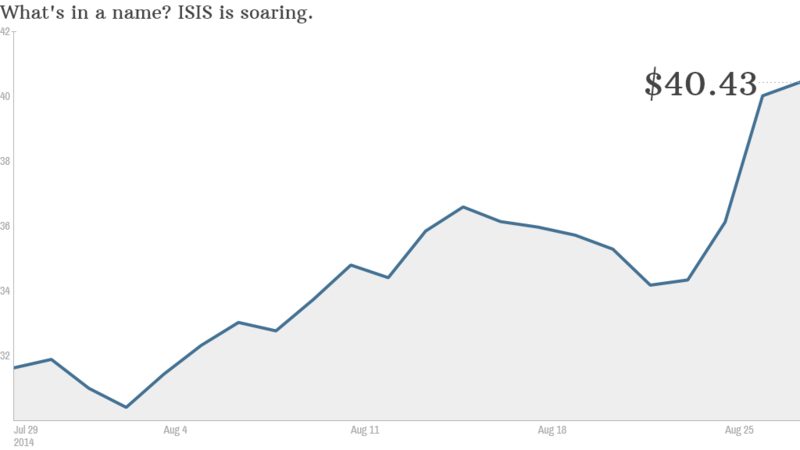 Isis, like many biotechs, is losing money. It is a risky bet. But there have been a flurry of deals in biotech lately. Larger drug firms covet firms like Isis, which have the potential to launch new blockbuster medications. On Monday, Swiss drug giant Roche (RHHBF) agreed to buy InterMune (ITMN), a developer of treatments for lung ailments, for $8.3 billion. For what it's worth, Isis has partnerships with deep-pocketed drug companies Biogen (BIIB) and AstraZeneca (AZN). So the stock may also be rallying on takeover speculation too. And if it ever did get bought, that's an easy way to kiss the Isis name goodbye.